And wonder at its pretty aaarrtstyle. Sea of Thieves is Rare’s upcoming seafaring pirate sandbox that’s due to launch/dock next year. Similar to the studio’s back catalogue of games, this ‘un boasts some typically easy-on-the-eye cartoon-like visuals—a sizeable chunk of which was showcased at this year’s San Diego Comic Con. 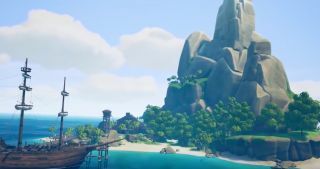 Rare revealed a snippet of gameplay at E3 in June—Tom also went hands-on (deck)—however the hour-long panel at SDCC saw the British developer discuss the game’s premise, what inspired its art direction, and some of the things we’ll be doing within as we island-hop across its idyllic bounds. Plenty of speculation there, but the most intriguing part for me relates to the game’s day and night and weather cycles, and how both are tied to exploration. That runs from around 3.42 in the video above if you’re keen to learn more about that. Sea of Thieves is due to launch early next year as a Microsoft cross-buy Play Anywhere game.